Tomorrow night (5/25) at Nashville’s 3rd & Lindsley, Girls With Guitars will get together and make some great music to benefit Nashville flood relief. 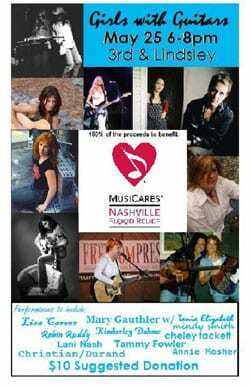 Singer/songwriters including Mary Gauthier, Lisa Carver, Robin Ruddy, Kimberley Dahme, Cheley Tackett, Lani Nash, Tammy Fowler, Annie Mosher and Mindy Smith will come together for a very special night of music for a great cause. Suggested donation is $10. All proceeds will go to the MusicCares Foundation, an organization dedicated to helping out musicians in need. The event will run from 6:00-8:00 PM and will kick off with an exciting donation match challenge. Those who can’t attend the show but would like to donate to the cause can make their check payable to MusicCares Foundation, and include “Girls With Guitars-Flood Relief Benefit” in the memo line. Send donations to Parlor Productions/Music Row Realty, 1317 16th Ave South, Nashville, TN 37212.